Don't just build a blog. Create a profitable business. But how do you make money blogging? Janice just started a blog and has no idea where to start to make money. She is wondering if it is possible to make enough to cover the expenses on her blog and maybe make an extra $100 a month to cover a date night with her husband. Sue started a blog about six months ago, placing advertisements in her sidebar to generate passive income. Imagine her surprise when she checked her account and had made... $0.10 from her efforts. She thinks, "There has to be a better way!" Terri has been blogging for a few years and makes a steady income but wonders how to make enough money to consider blogging a full-time job. Janice, Sue, and Terri are all at different phases of blogging but each person realizes that something MORE is possible. When it comes to building a profitable blog, they are missing a critical piece of information. I understand because I was there! Feeding my children with government assistance. Needing a way to increase our income dramatically. Working a blog that was barely bringing in $100 a year. Ready to turn your blog into a money-maker? Access the course immediately and start making money. Please note: This course is included with Inspired Bloggers University Membership. Learn more about Success Membership. Whether you are a blogger who is curious about making money with your blog or an experienced blogger looking to push your income to the next level, Monetize45 is designed to help you set and achieve your goals in less than two months. 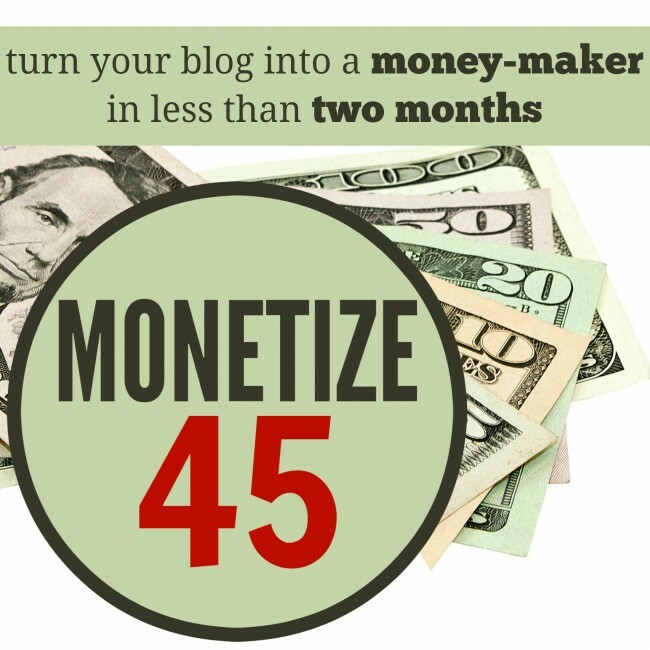 Monetize45 provides you with the tools you need to make your blog a money-maker. The first 8 lessons focus on a blog overhaul. Then, you dive into lessons to help you find the income streams that fit your blog niche and increase your blogging revenue. Creating a media kit... a media what?! When I started this course I had only just started my blog. I was so new and had no idea what I was doing, but with this course I have learned so much. I can now honestly say that I am a professional blogger with confidence. I felt like Tabitha tailored this course just for me with her easy to follow assignments and blog tweaking tips. Thanks to Tabitha I now own a successful money making blog! Monetize45 has been an excellent course! Just by following the advice, in 6 weeks, I gained many social media followers and my page views went up 260%. While I am not making much money yet, I am now in a position to be considered a “real” blog by companies. I have even created my first mini-ebook with plans to create a full length book. All because of this course. I highly recommend this to any blogger who is looking to start making money with your blog. Some of the changes are simple, some of them are more involved. But all of them help to show you what you blog can be when you put the work into it. This course has taught me so much to improve my blog and now I have more than a hobby, I have a business. I can’t thank Tabitha enough for patiently walking through the steps necessary to create a successful blog. I’ll be using her tips, check-lists and wisdom to keep me on track from here on in. Why? Because Monetize45 works. Please note: This course is included with Inspired Bloggers University Membership. Learn more about Lifetime Membership. This course was amazing. It was so jam packed with content that I kept double checking to make sure I saved everything to be able to go back and review later. I did start this program with very little readers or focus on where I wanted my blog to go but I found it incredibly helpful to give me focus and a plan. Thank you Tabitha! Step by step, bite size pieces that don’t make you feel dumb or talked down to. I’ve been blogging …forever… but just started considering monetization. Tabitha did a WONDERFUL job making this understandable, yet meaty. I recommend this to all bloggers! I was so excited when this course came around. The initial days are a little overwhelming, but push through them – it is SO worth it. Every area we concentrated on in this course showed an increase on my end. Overall, I was very pleased with my progress. But even more than that, I am beyond pleased with the wealth of knowledge offered in this course!! You can’t beat it for the price!! What a STEAL!!! WOW!!! That is the first word that comes to mind when I think about what this course has done for my 5 month old blog. I learned so much in such a short time that I have decided that I will have to go back and start Monetize 45 again. If you are a newbie blogger or even a seasoned one, this is definitely for you. 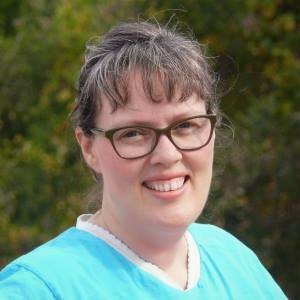 Tabitha gives you tasks and challenges you to think about the direction of your blog, to assess your weaknesses and strengths and then provides the tools to grow your blog. Thank you Tabitha, you have single- handedly opened my eyes to what the world of blogging has to offer. I’ve been blogging for years, but I learned SO much from this course! I started out blogging just as a hobby, but folded in monetization in little bits here and there. This course puts you into a focused hyperdrive of learning all of the key principles in successfully building your blog into a brand. I am not hosted on Wordpress. Will this class help me? Does my access to the class expire? No. Once your purchase Monetize45, you have permanent access to the class and any future updates. Will this program work for those who do not reside within the United States? Yes. Many bloggers of various nationalities have taken Monetize45 and seen results. Please be mindful that the laws in your country are different and you should verify the licensing needed for your location. Also be aware that disclosure and attribution laws differ by country. You will need to research these details prior to monetizing your blog. How can Inspired Bloggers University Paid Members access the private Facebook group? Paid members should visit the course page (available through your profile page) to find the link to the private group.